As we all get ready for back to school (or are already back in school), whether it be Kindergarten or 8th grade its always fun to get vizzing and to get your kids involved! Recently, the one and only Anya A’Hearn posted her inspiring quantified self project “Consumed”. My daughters are quite young, in the womb, 3 and almost 6. The thought I had was to have them build this type of viz with something they have way more of than they need. For us, an easy candidate for this was their (ridiculous) stuffed animal collection. One step that I missed at this point, was getting a guess from everybody on how many stuffed animals we actually had. Looking back at it now, I think we all would have grossly under estimated the number of animals we have. Oh well, something to remember for next time. I didn’t really have much of a plan going forward at this point, but next we decided to split up the animals into different categories and make smaller piles for each category. I had the thought of breaking up the animals into the different types that we had, e.g., bears, people, etc. The girls were on board with this, but also overruled the appropriate category for some of their “specials”. This is why there is a bear in the monkey pile, a seal in the “pets” pile, a rainbow bunny in the people pile, another bear in the “Elmo” pile and so on. At this point we decided to each make a guess at how many stuffed animals were in each pile. This part was pretty fun and we even got Mom involved on the guessing as well. 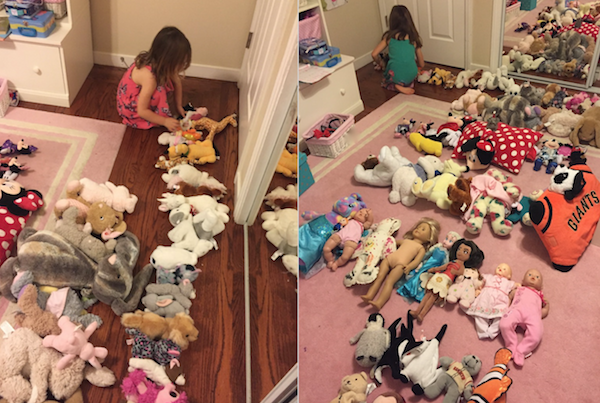 The best part for me; watching my almost 6-year-old take the piles and put them into lines so that she could make more accurate guesses for our game and when my 3-year-old guessed “a lot” for one of the big piles. Once we finished our guessing game, we made a big bar chart so that we could get actual counts for each of our categories. Our almost 6-year-old came in the big winner, only being one stuffed animal off of the total. The only thing left to do was for the kids to document our real life bar chart on paper (and apparently add some spirals, thanks Moana). Lastly, it was time for Dad to translate that into Tableau, including matching colors and smiley faces in each bar. I tried to talk them out of this and explain visualization best practices, but, as you can see I was not successful. I hope you find some fun items and concepts to viz at home as well and look forward to seeing your results!